It's summer time and like I mentioned in my last post that I indulge in eating light food and drink loads of water to keep myself hydrated. Keeping the requirements of summer and how one would indulge to shove away the heat, I have kept the theme of next month's event as 'ONLY' Summer Food & Drinks. 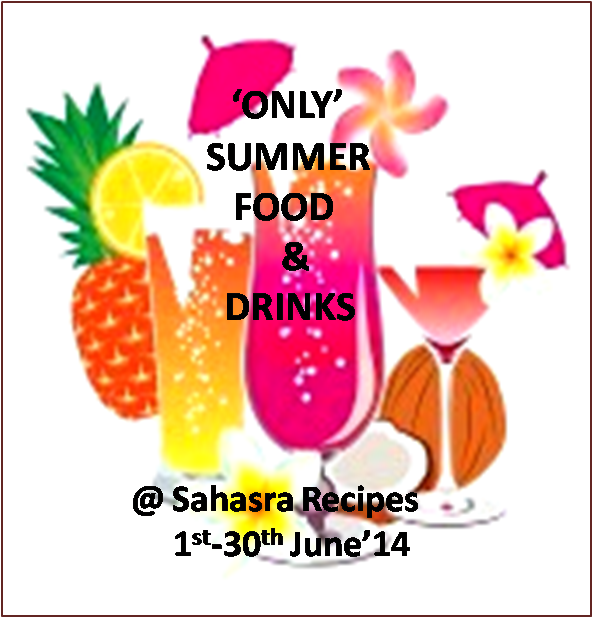 The event is guest hosted by Shailaja of Sahasra Recipes. The give away book for the event is Healthy Juices which is sponsored by www.tarladal.com. The book has recipes of juices made using fresh fruits and vegetables. The book gets shipped only in India and is given only to the followers of my blog. The event will run through the month of June, so don your chef's cap and create healthy and interesting recipes to be savored in summers. It can be smoothies, ice- creams, juices, mocktails, desserts, savories and so on..choice is completely yours. The details of the event and the rules can be checked now in Shailaja's blog. wow thats an wonderful event !! will try to participate ..